Especially in the aftermath of the Belmont bathroom debacle, NYRA has gotten a lot of criticism about its customer service. Now I recognize that an answered e-mail is not quite the same as a flushing toilet, but I commend the organization for its responsiveness. For the third time, an e-mail that I sent with a request/question was answered within a reasonable amount of time, this time less than twenty-four hours. I sent a blind e-mail (meaning: I didn’t know the recipient and was taking a guess that my query was directed to the right person) regarding the Triple Tiara confusion, and within twenty-four hours, I received a gracious reply confirming that the current series is the Mother Goose, the CCA Oaks, and the Alabama. The person who answered my e-mail cheerfully volunteered to look into why the program on Saturday said otherwise. This is unlike my experience with WNYC, at least one National Public Radio program, and an upstate racing history entity, to whom I sent querying e-mails without ever getting a response. So, thanks, NYRA. If you haven’t already, check out fellow TBA blogger Frank at That’s Amore Stable, who with his most recent post confirms what I had begun to suspect, that we are in fact separated at birth siblings, with his post on hockey playoff beards, a losing streak at the track, and Catholic saints. 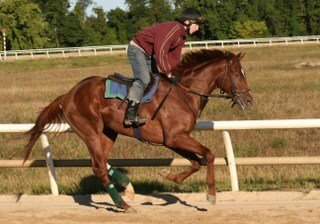 Last October I wrote about my night-time visit to the Middleburg Training Center, noting the presence of a friendly and spirited one-eyed two-year-old chesnut colt. Now three, Above All Odds came north late in the winter and has been coming along under the care of Allen Jerkens, and he makes his first start on Wednesday. Here’s hoping for a safe and successful trip. In the run to the Belmont, there was discussion of whether a Big Brown Triple Crown would be good or bad for the game. Based on what I see on my TV each morning, it seems that Triple Crown or no, Big Brown and his team have certainly raised the profile of racing. Most mornings, there’s some sort of racing update on the ESPN crawl—usually it has to do with Big Brown, but yesterday and the day before it noted Mast Track’s win in the Hollywood Gold Cup. This morning, we’re back to Big Brown, with a story about the horse being listed on the “rundown” on the right side of the SportsCenter screen, and with Michael Iavarone being quoted on the crawl as saying that his patience with Richard Dutrow is “wearing thin” and that Dutrow is “on a short leash.” (Aside: Am I the only one who thinks that Iavarone is getting a little carried away with himself? This, after a Grade I win with a 40 – 1 shot three days ago?) So whether it’s good news or bad, Big Brown’s career has kept racing in the news, and I suppose that’s a good thing. Changes afoot for Belmont Stakes ticketing? “I recognize that an answered e-mail is not quite the same as a flushing toilet.” Didn’t Emerson say this first? — J.S. If I had to authenticate the duck, you should have to authenticate the cow.Don’t Drink that Milk! until further proof is supplied. I’m kind of disturbed, I just checked my frig and my milk does not indicate that it comes from REAL COWS! Oh no! !